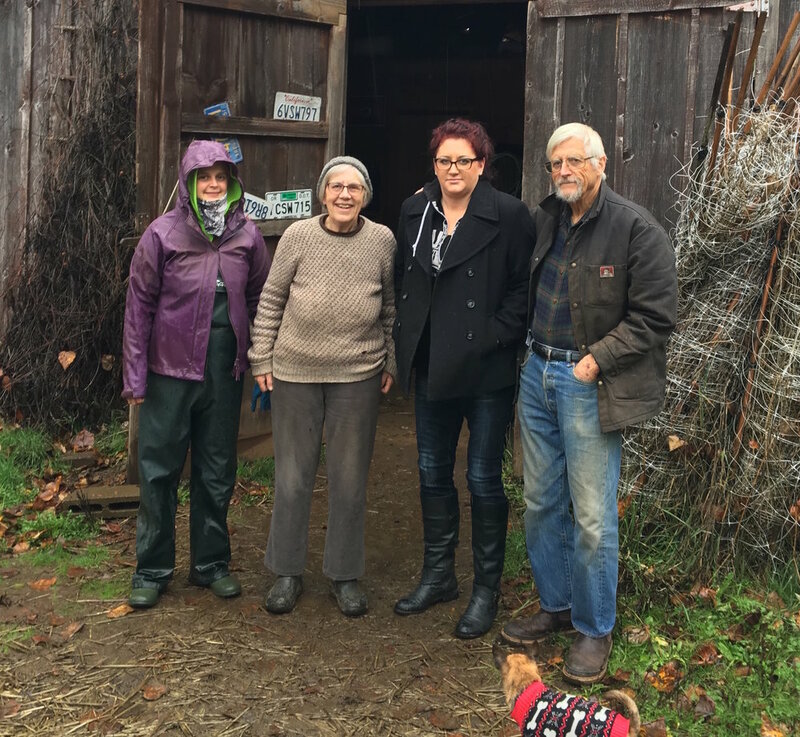 Diggin’ Roots Farm is a 50 acre certified organic farm on the eastern side of the Willamette, tucked just next to the foothills of the Molalla River corridor and the Table Rock Wilderness. Our farm encompasses a 4 acre riparian area with a seasonal creek that splits off 7 acres of the property. We have huge open skies and an amazing oak-lined horizon with perfect sunsets. We are 8 miles from Silverton, which is where we go to farmer’s market and focus much of our CSA (Portland is our other main outlet). Silverton has a movie theatre, good restaurants, and many festivals throughout the summer. The opportunity to tend this land and call it our home is a privilege for which we smile every day. We are drawn to this livelihood by a magnetism of purpose, abundance, and place. It is not easy. We are not perfect. We learn and evolve with each passing season, and we hold our responsibility as stewards on the horizon: we strive with heads up and eyes open, nurtured by good food and grounded by the unknowable. Our operation continues to evolve with our current plan for 2017 including the CSA, a farmer’s market, a farm stand, and continued sales to restaurants. We’ll be minimally expanding our production to total about 4 acres of vegetables. We expect approximately 18 ewes to give birth to 18-30 lambs starting in February and we’ll be tending to a sow and her litter of piglets sometime this winter. The pasture is intensively managed with our animals and complimentary cuttings of hay or silage. Initial talk of the 2017 season includes improving our recordkeeping systems, especially around cost of production, possible expansion to other types of livestock, continued focus on conservation projects (pollinator hedgerow and riparian restoration), and establishing a farm stand. Each day begins with a quick meeting to discuss the tasks of the day — many things are routine, but all aspects of the farm have the potential to change on a daily basis as conditions shift throughout the season. We intend to train alongside you to offer demonstrations but you will also be training alone sometimes as we juggle childcare, fieldwork, and time away from the farm. We will always be available on the farm or by phone. We love farming and consider a job-well-done to be its own reward. We hope you feel the same. Carpentry and livestock care will be woven throughout the season as needed. Student accommodations will either be a small studio apartment or trailer. Either will include heating and electricity, a composting toilet, and shower. Student(s) will have access to an outdoor washing machine and clothesline. Wireless internet will be available on the farm but may not be available in the housing. The student(s) are responsible for keeping their living space clean. No smoking or illegal drugs are allowed on the farm. No substance use of any kind is allowed during training hours. Pets are not allowed. We expect 8-10hr training days, 5 days a week,with an average of 40 hrs/ week. This will include some Saturdays for help at market. Time off will be considered and must be discussed in advance of hiring. We will provide room, board, and an education stipend. Details of the room, board, and stipend package will be discussed during the interview process. We are looking for a student or couple to join us for the entire season April-November. If a couple is interested both parties do not need to be part of the RFC program, but there may be potential for part-time employment opportunities available depending on skill and interest. The first month will be a trial period. Candidates are required to visit the farm before we embark on a season together. Quackenbush Farm started in 2013 as partnership between 4 friends. We were young, motivated, and wanted to grow a business based around community health and vitality. Each of us contributed a thousand dollars as startup, or seed money, and kept our day jobs. We found a rental with property with a brave landlord and within a month of signing the lease, we plowed the field. Over the years the farm has evolved, growing and reaching new markets and customers. In 2017, the farm found a permanent home when Matt and Jennifer purchased 18 beautiful, flat acres of pasture and oak savanna in Eagle Creek, Oregon. Through all the changes over the years we have stayed committed to our ideals, and remain idealistic in our hearts and actions. Our focus has primarily been diversified, organic, fresh market veggies. The farm is a thriving business with our main markets being our CSA program, 4 weekly farmer’s markets, wholesale, restaurants, and a small on-site farm stand. Recently we have expanded into pasture-based livestock production, including a small flock of Katahdin lambs and several batches of broiler chickens each year. The farm family and crew for 2019 include Jennifer and Matt and their little newborn, past intern and seasonal farm helper/yoga instructor Rhiannon, two RFC interns, a small group of weekly harvest volunteers, and seasonal WWOOF’ers. We are located in the beautiful Clackamas River Valley, about 30 minutes southeast of Portland, close enough for convenience but far enough away for peace and quiet. The closest population center is the old logging town of Estacada, about a 5 minute drive from the farm, where you have options for food, drink, and groceries, etc. The area is full of adventures and beauty, with the Clackamas River down the road, Mount Hood National Forest, Milo McIver State Park, and Estacada Lake just next door. Working directly with the farm owners in all aspects of day to day operations, you will gain an in-depth understanding of growing for farmer's markets, local restaurants, and our surrounding community. With 2 acres in production of annual vegetables and the remaining 16 acres of pasture dedicated to poultry, lamb, dairy goats, and many future projects, our interns will have the opportunity to gain a well-rounded sustainable agriculture education. Our goal is to provide a guided, hands on learning experience in the field, in the planning room, and at the farmers markets, with opportunities for independent farm projects. Overall duties include field work, irrigation, tractor and small equipment work, farmers market sales, seeding, planting, animal husbandry, volunteer coordination, and record keeping (to name a few). Some examples of past independent projects include building a medicinal herb garden, building and running a pastured meat bird enterprise, building beehives and beekeeping for the season, and writing a cookbook based on farm recipes and crops. Each intern will commit to 40 hours of training per week, which is typically accomplished over 5 work days, with two days off each week. Spring (April, May, early June) – The focus of this season is greenhouse work, field preparation, building/refurbishing farm infrastructure, and planting. Summer (Late June, July, August) – This is the time for our biggest markets, big harvests, weeding, pruning and trellising, and more planting. Fall (September, October) – The pace starts to slow a little here, with planting mostly over our focus now is harvesting, weeding, marketing, farm projects, and eventually turning the fields over and planting cover crop. No previous gardening or farming experience is required, but we do expect a strong work ethic and a willingness to learn. We value clear and open communication and expect that our interns are actively engaged with questions, comments, and input on the farm operation. We are looking for two interns to commit to the full season from early April to the end of October. We ask that prospective applicants be willing to meet in person on the farm prior to acceptance into the program. RFC interns are provided room, board, and a monthly stipend. Housing consists of two large canvas wall tents (12’x14’) on platforms furnished with wood stoves, beds, some furniture, and electricity. They are spacious and very comfortable, and are located in a private grove of oaks with an outdoor hot shower, composting outhouse, hot tub, fire pit, and wood sauna. Other amenities include an outdoor kitchen exclusively for our interns with major appliances, access to our washer and dryer, and wireless internet throughout most of the property. We provide staples such as grains, beans, oil, spices, eggs from our laying hens, and produce from the fields. We also encourage bartering at our farmer’s markets with our produce for other items like meat, fruit, etc. Interns are responsible for preparing their own meals, but we typically will have one group meal a week. More details about room, board, and stipend will be discussed during the interview process. Swallowtail Farm is a 26-acre magical little hideaway tucked into the northwest corner of the Portland metro urban growth boundary. We are a five minute drive from Hwy 26, 25 minutes from downtown Portland, 50 minutes from the Coast, and a 10-minute bike ride from downtown Hillsboro and the MAX blue line. Owned by Swallowtail Waldorf School since 2004, the property is home to abundant wildlife with 13 acres in riparian margin bordered by McKay Creek on three sides. There are 12 acres of wet prairie/pasture and agricultural land, one acre of physical structures, a parking area, an orchard, herbs, flowers, and permanent veggie garden beds. The farm is a hub of communal activity sharing in the abundance of nature, beauty, education, and food. We welcome participants of all skill levels and all ages in the exploration of biodynamic agricultural practices. This year's production off the farm will be a 35 member School Year CSA share ( 33 weeks from September 2018-June 2019), 10 hogs, 3 steer, 5 sheep, and whatever wethers we end up with from the goats, all on pasture. We have three does that we milk for primarily farm use, with a small amount to sell. We preserve and dry all the fruit we can from our trees, shrubs, and cane fruit, to add extra offerings in the CSA, and eat ourselves. We keep a small flock of ducks for farm eggs, and have hives for honey. We also run a weekly-ish market table for 25 weeks at Swallowtail School's main campus from September through June. Striving for primarily hand work in the permanent gardens, and minimal mechanized work using a BCS in the outer fields, we also have two mini donkeys that we are slowly working towards light cultivation and pack work in the fields. We prefer a scythe over a weed eater, but have both. We walk behind our tractor rather than sit on it, and would love for the donkeys to be a little more useful at carrying loads. In the meantime, we try to use handcarts over the truck to move heavy stuff around. Aside from food, our animals are an integral part of a large scale restoration project we are working on with Clean Water Services, and play a key role in our nutrient cycling and fertility management systems on the farm. Then there's the rest of life, outside farming! We like to dance, play music, be goofy, laugh and cry, find some shade by a creek when it's hot, and a cold beverage in the hammock after a hard day's work feels good. April comes, and we are in the tail end of our School Year CSA with lots of greens cycling off the farm. Mondays and Tuesdays are generally spent in the field, Wednesday and Thursday are our harvest and Market days, and Friday is generally a day of fencing, infrastructure, and regrouping... But! We live and work with Nature! So, we are always consciously trying to blend the rhythms of the earth with that of a modern-day American life, and stay joyfully open to whatever the land is asking of us. April also sees our does in milk, the sheep, hogs, and, steer out on pasture, and our spuds and alliums planted for the following season's production. May is much the same with the addition of a great children’s presence as the sun comes out and we once again venture out into green trees and warm spring air. The decision to be involved with school groups is something we leave up to the individual, and is only asked if it speaks to them. Every day holds a healthy animal care rhythm followed by whatever tasks are necessary in the gardens. June brings a small out breath and regrouping consisting of a few plantings, irrigation prep, and overall clean up and organization for the months to come. July hits with a hot dry bang and daily bed prep, planting in the prop house and field, and keeping everything watered. August holds much the same as July. Tending to the animals, cultivation/bed prep, planting, weeding, and irrigation. September sees the weekly Wednesday/Thursday Harvest and Market rhythm reinstated, school is back in session so the children reappear, and many of our animals are thanked for their service, then tucked into the freezer. We continue the same rhythm through October. Then batten down the hatches in November with Caterpillar tunnels, low tunnels, floating row cover, and hope. By this time we have enough crops up out of the ground and in storage, or in the ground and protected from the harshest elements, to last us till late February, when our planting calendar begins again. It is also in the beginning of November that farmer Noah will reluctantly say goodbye to those amazing helpers who have loved and cared for the land alongside him from the Spring till the fall. Blessings on the earth, and the hands that tend it. - All aspects of French intensive style market garden management with a focus on fall and winter production. - All aspects of integrated animal husbandry using movable electric fencing on a high rotation rate. - The many joys of living life on a farm, often with 3-4 kids in tow if that suits you, or in the periphery if not. I am a firm believer in teachable moments. Especially in the experiential-based learning environment of a farm. In a past life I was an Outward Bound instructor for adjudicated youth. We did 45-day canoe trips in the Florida everglades and a few other waterways. The basic model was simple. First, lead by example, then co-create and work together, then hand over leadership and provide suggestions were deemed fit. The succession through these stages is of course delegated by the individual and their ability to display a proficiency in any given task. I have also built up an extensive library over the years that I will always provide full access to, and use as a tool to fortify anything we are working with at the time. Some weeks will be 30 hours, some 50, with no more than 40 on average. Two days a week with no responsibility on the farm is a goal for all interns, with the occasional animal feeding in the morning and evening on a 6th day. Time for extended trips away from the farm are open, but preferably will be planned ahead at the beginning of the season. First and foremost, the desire to truly be a farmer is a must, and preferably an all-encompassing one, not solely focused on animal husbandry, produce, or perennials. Flexible, comfortable in adverse environmental conditions, physically strong (specifically a good back), a good communicator and calm, kid friendly, and community-oriented. The hourly and weekly schedules will be driven both by the farm's needs and the needs of the farm team; adaptability to a variable workload will be crucial for a healthy fit. The intern should be able to advocate for his or her own interests and needs, but to balance those with the demands of the farm, colleagues, and broader community. A visit would be preferable, but not absolutely necessary if there is enough correspondence prior. The intern will be required to sign a contract and submit a background check. Room and board is included in the internship package. There is a furnished 24 ft yurt out the back of the Farmhouse. Kitchen and bath is shared inside the farmhouse. Each day, one member of the farm crew will take time out to prepare lunch, clean the kitchen, and tidy the common areas. Wednesday and Thursday dinners are communal meals, and as such, a cooperative prep and clean up feels the best. The farm family eats meat but can accommodate vegan or vegetarian diets. Breakfast and all other meals are up to the intern, although all staples, vegetables, and animal products will be available for meals. Participation in a monthly deep-clean of the common living spaces will also be expected. Farmer Noah has three children that live on the farm half time. They are a rowdy bunch full of beautiful life, ages 7, 9, and 11. Just as is the case with the animals and plants that we tend on the farm, The Marquis Three are our future, and deserve the same integrated approach in terms of nurturing love and care. The stipend will be discussed during the interview process. Fiddlehead Farm is a women owned and operated family farm tucked into the Sandy River valley in the rural community of Corbett. The farm is nineteen acres, with six acres in cultivation for the sustainable production of Certified Organic vegetables. The remaining acreage is kept in native forest that is dense, wild, and beautiful. Given this balance we are committed to growing food in an ecologically sound manner, with special focus on conservation. We feel very strongly that food production has huge implications on quality of life, environmental health, and community vitality. We are excited to share our practices with the next generation of farmers. Corbett is a small rural community located just 20 miles east of Portland, at the mouth of the Columbia River Gorge. The area is rich in natural beauty and has many hiking trails, viewpoints, and swimming holes, some of which are accessible directly from the farm. The local grange hall is a popular gathering place with regular classes, potlucks and square dances. To experience all of what Corbett and the surrounding areas have to offer we require that interns have their own transportation. We take great pride in the food we grow and our vegetables are known for being of the highest quality. Our produce is sold through a CSA, at two busy farmers markets, to a local natural grocery chain, a food coop, several processors, and a small handful of restaurants. Fiddlehead is a production focused farm. Our family derives all of our income from the farm so we work hard to maintain a thriving and sustainable business model. A unique aspect of our mentorship is we are in the fields full time with our new farmers. We provide strong structure to each day with clear goals and expectations, and lead by example for efficient farming habits. We strive to balance physical projects with less strenuous tasks. Not only does this keep our bodies healthy, but also helps keep morale and productivity high. Initial learning for each task will come in the form of clear, detailed instruction, but most of the skill development will come about through observation, repetition, and reflection. We very much enjoy sharing our insights and thought processes, and are committed to fostering an environment of clear, open communication. The training of interns will be a combination of team projects and individual activities that shift regularly. We value the ability of interns to listen and follow directions, as well as observe and emulate. RFC interns will train directly with us 5 days per week, 7-9 hours per day, on most aspects of the operation, including but not limited to: planting, harvest, weeding, irrigation, wash/pack, trellising, sorting, cleaning, organizing, farm improvements, and potentially marketing and deliveries. We accomplish these tasks through the use of hand tools, tractors, and scale-appropriate equipment– all of which interns will become proficient in the use of throughout the season. Our crew consists of farmers Katie and Tayne, two Rogue interns, full and part time staff, regular volunteers, and wwoofers during the peak season. We find that having a rotating but solid pool of helpers keeps the work days fun and motivating. The farm regularly hosts volunteers and wwoofers from diverse backgrounds, and we work hard to create a safe and welcoming environment. Any form of racism, homophobia, transphobia, or bigotry will not be tolerated. Intern accommodations are either a cozy airstream trailer or a small cabin with a loft. Both have heat and electricity. A fully stocked outdoor kitchen with a refrigerator, gas range, and hot water is shared among the interns and wwoofers, as well as an outdoor shower and composting toilet. Interns have access to an outdoor washing machine and clothesline. Wireless internet is accessible near the barn. We provide interns with a full and healthy “vegan” diet (although we are by no means a vegan farm) that includes basic staples (bulk beans and grains, oatmeal, oil, spices, etc.) and an abundance of produce from the fields. In addition, we pay for interns to access a food salvage program at the local grange that provides a hefty volume of quality food. There are several farms nearby that are open to trading for dairy, eggs, and meat if there is interest. Interns are responsible for preparing their own meals and there will be a potluck once per week. We are looking for interns who are thoughtful, considerate, hardworking, and dedicated to an entire season (April – October). We value communication, positivity, openness, and curiosity. Ideally, we’d like to meet with prospective interns on the farm prior to the season starting.